Yes, all books on Bubblin are functional websites. No worries, let’s walk through some of the main differences to see what kind of impact we are talking about here. First off, traditional e-books are ‘format files’ that need to be downloaded off the web before consumption. This is a complex extra step that people need to go through before they can get to reading. A Superbook on the other hand is available on a url that’s easy to share and the book goes offline the moment you open it up for reading on the browser using a service worker. There is no need for an explicit download to the disk. By ‘complex’ extra step I mean the usual flow where the interested party has to first share their email address and then validate the email address to receive a file, click on the file to download it, wait for it to download and then navigate to the artifact on the disk and click it open on a reader software that was installed earlier separately. Phew. Did I miss anything? I suspect that most people will skip reading a digital book and order a physical book instead simply because of how difficult it is to reach the step of finally reading the story. With physical books at least it is so much better afterwards! Not only this, people often download a file to grab a copy during an early bird offer or sale but will not return to read because they forgot about it. The process of navigating to a file and reopening it each time to read (away from web) is obscure, cumbersome and it is very easy to forget what’s on the disk. It’s like Tsundoku in digital realm. Put simply, the investment expected of a user to succeed at reading digital longform outside of web is way too high. It is better to give them the book online where people already are. On web. Web makes it easy to share and come back to the book again and again. This is one of the core missions of the Superbook format, and would ultimately mean a huge impact. Second, almost all e-book formats require that people install additional software–an app–which is usually a reader application that is both a file manager and a file viewer. Some providers also push for buying proprietary hardware to be able to read digital books—like the Kindle or the Kobo. This is an industry-wide trend that I believe leads to a bunch of islands with the same books over and over again whereas people are left stranded on these islands far away from each other with no way of knowing what others are into or missing in-between. People miss the conversation, the annotations and the real story around the book! As we have seen with other products in the past, this kind of fragmentation leaves behind a waste of unsustainable communities with poor interoperability, poor upgradability and massively unresolvable compatibility issues due to being a closed non-web subsystem. Not an ideal situation for readers, much less so for writers! In my opinion wading through a mollases of non-web products, file formats and a list of issues for every single title that I’m interested in is a far cry from the original promise of software. The pathology of driving people to download a file masquerading as an e-book is twisted. It is borderline nuisance even. This pattern needs to change and we need to stop relying on the assumption that web is meant for distribution and not consumption of longform. This is a strategy of the 90s that we must do away with. There have been several startups in recent years that have tried tackling longform in form of scrolls and slides on the web (think Wattpad, Fanfiction, Scribd etc.) but none have succeeded at convincing the end users to switch from physical books. The mass market still loves the dead-tree medium and there haven’t been enough (any?) projects that tried tackling this problem using a true Roman style codex format. A format that follows the definition of a common book closely. Apple launched the iPad (iBooks) with codex style pagination and page curls initially, but they soon lost focus and went after other products instead. There were a few projects that tried implementing a page turner using flash and other third party software but those wouldn’t scale either due to lack of semantics or poor usability, or both. The Superbook format intends to fill this gap. So. What is Superbook you may ask again! Well, Superbook is a native book format for the web. It is designed to work seamlessly across all modern browsers and as mentioned before it is also offline-first. The definition of a Superbook is based on a common book i.e following the Roman codex style of pagination that makes a reader drool. You can read more about the underlying concept and why it follows the definition and what the concerns are of bringing a common book on web as opposed to a digital file. Likewise, the publishing conventions of a Superbook inspire a lot from art and style of paperbacks intersected with modern design and development techniques of the web. The core philosophy of Superbook is to make longform storytelling compelling and accessible on web. Try this demo book on your desktop, iPad and mobile. Resize your browser to see content scaling in action. Superbook format solves certain technical complexities of scaling text responsively and does so gracefully with suppport across all major browsers. A compendium of a issues identified so far can be found here. Since the paginated content of a Superbook is always available above the fold, the book remains visually accessible at all levels unlike a deep long scroll. No effort to download, navigate and manage files. No headache of format support or compatibility issues. Semantic markup that is easily searchable over the web (Google, Yahoo or Bing). Super responsive illustrations and clean web-compatible typography. Strong layouts as opposed to fixed or fluid layout. Pretty shareable urls with page numbers. High quality line-tracking and flexible formatting (control over orphans and widows). Instant readership and social sharing. Dynamic content and visual experimentation. Better line-tracking, format handling and accessibility. Better royalties and larger spread. A Superbook can easily go fullscreen with a click of a button and the content scales like it was printed on spandex as opposed to traditional formats where it is either fixed or fluid in nature. It is iPad first, offline-first and is supported on all modern browsers, operating systems and devices. Superbooks are closer to physical books in behavior than digital files. The only difference between a paperback (physical form) and a Superbook is that the formatting basis and design rules that apply on content sitting inside a Superbook are that of the web. By doing so we are able to avoid importing skeuomorphic elements of the physical avatar and go forwards with an explicit intent of maximizing accessibility, availability and ease of use. Pagination and reflow is handled early, during the ‘book making’ process and the task of cutting up content with precise line-tracking, typesetting, illustrations and flow editing is handled on the server-side. Since pagination is moved ahead of actual rendering, the headache of scaling content correctly is removed from browser’s list of responsibilities. What the browser handles instead is only the presentation of a chunked out page scaled correctly with a page number attached to the url without succumbing to reflow. These pages are just as polished and “consumer ready” as on the physical form and the strong layout guarantees smooth rendering across all platforms. It is truly like being on the same page, on web! If you find this project interesting, help yourself to dig more with a deep dive on how bifolium stack design of a Superbook works and how it is different from ordinary websites. Contributions to the format and associated libraries are welcome. 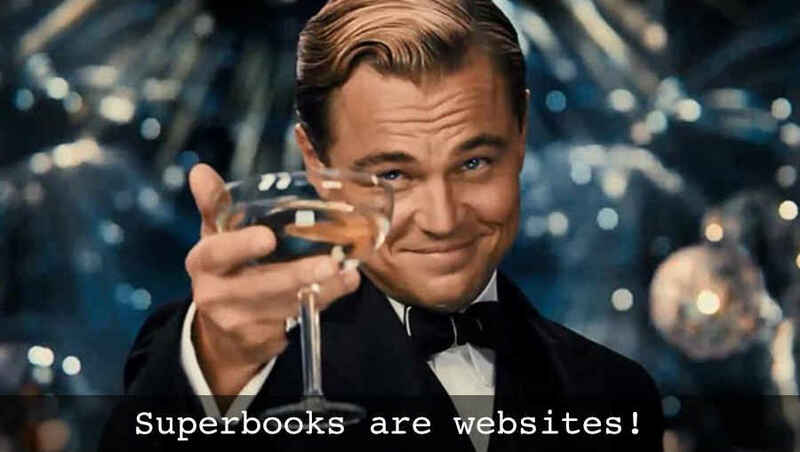 Great!, now repeat after me: Superbooks are websites and not files. Unless specified otherwise, the Superbook format is available as an open standard for codex style books, comics and other bifolia on web under the Blue Oak License 1.0.0. If you have any questions about the format or the underlying tech or how to get your book on Bubblin(this site) or on your own, feel free to contact us here. Written by: Marvin Danig, CEO of Bubblin Superbooks. Follow me here on Twitter! Reviewed by: Sonica Arora, CTO of Bubblin Superbooks and Anup Bishnoi, SSE @Netflix. Bad to the bone.